If you have any questions not answered below, please email order@branchstudio.com. I'm happy to answer your questions! To purchase paintings, browse the Painting Galleries and choose individual paintings. Below the painting image, you will have purchase options for prints or the original, if available. Click on the "Purchase Painting" box. This sends you to your shopping cart. From there, you can choose to continue shopping or move to Checkout. Never buy anything online when you're not completely satisfied with the reputability of the seller. If you have any questions whatsoever about my work, products offered, delivery or security of the transactions not answered below, please email us at order@branchstudio.com . Purchases should never be a surprise. You should know exactly what you're ordering and get it promptly! Original watercolor paintings should be handled taking special care to avoid any contact with water or mist. They will be destroyed. Please make certain that your hands are clean, dry and oil-free before touching, and frame using acid free mountings. Prints should be treated like original watercolor paintings. Never place original watercolors or fine art prints in direct sunlight. While Jennifer Branch always uses archival watercolor paints and paper of the very highest quality for her original paintings, direct sunlight will eventually fade anything. Well cared for watercolor paintings will actually last longer in the same condition than an oil painting. Direct sunlight accelerates fading greatly. We have tested our limited edition prints for the 3 months of summer outside in direct sunlight. They did not fade at all. Our reproductions are rated for 200+ years. However, not placing originals or prints in direct sunlight is a good guideline. 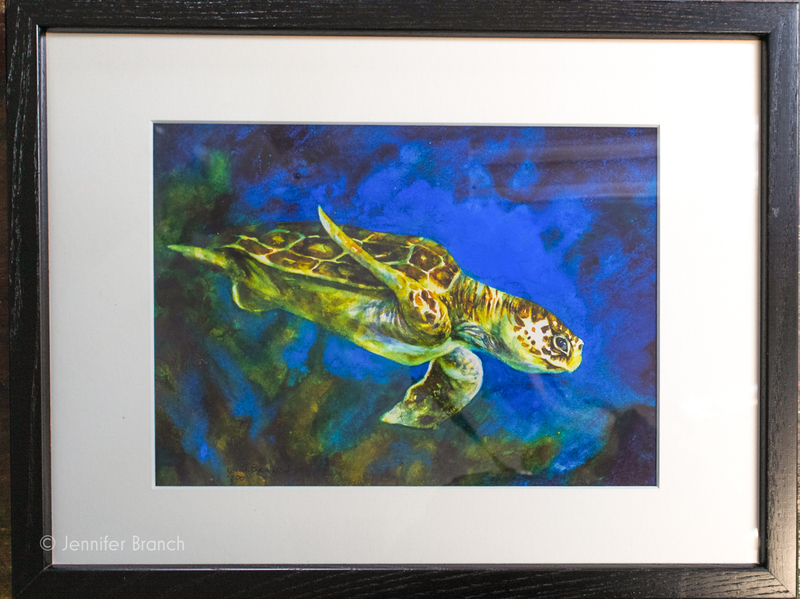 Since original watercolor paintings are one of a kind works of art, Jennifer Branch Gallery can't guarantee the availability of any one painting. If an original painting is unavailable, we will immediately contact you. Original paintings are shipped in archival double mats for protection and presentation. They are not permanently mounted in the mats for framing ease. The mats are made for individual paintings, not necessarily standard sizes. Many of my watercolor paintings are on handmade Twinrocker paper. Besides not being in standard sizes, many are intended for floating matting, with a gorgeous exaggerated deckle that deserves to be seen! For the safety of the paintings, we don't mount the paintings with the deckle showing, but protected by the mat for shipping. Floating mounting requires more adhesive and mounting points than your framer would like and will not always hold up to shipping. We prefer minimalist safer mounting for paintings that will be framed professionally. If you will be using a standard size frame and framing yourself, please tell us and we will try to work with that. 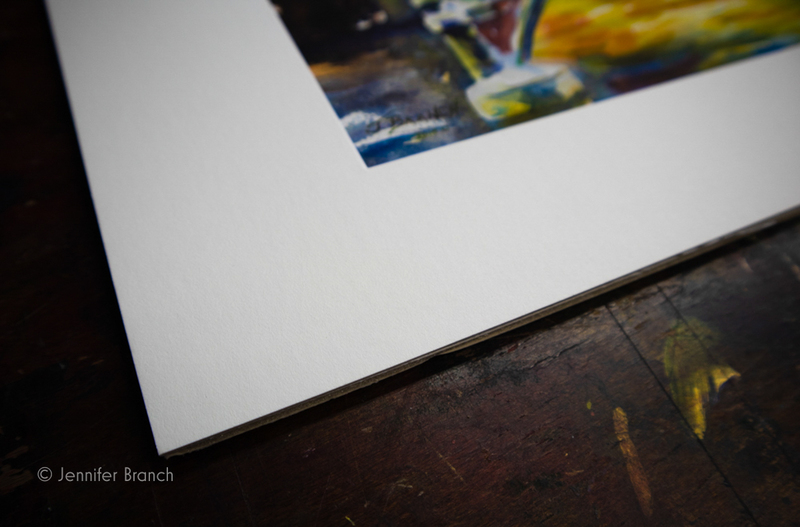 Our giclee limited edition reproductions are printed on the highest quality printer available, an Epson P5000. The Epson inks used are rated at 200+ years and very water resistant. We're very proud of always using the best technology available for our reproductions. Each reproduction is color corrected by the artist and individually signed by Jennifer Branch. Our reproductions are limited edition, in production runs of 200 prints only. Available sizes are limited by the size of the original painting and chosen by the artist. We have always produced our reproductions in-house to guarantee the best quality possible. Our smaller prints are shipped in standard frame size acid free mats, enclosed in archival clear sleeves. They're ready for presentation or could be displayed by simply propping them against the wall. The 5" x 7" prints come in 8" x 10" mats and the 8" x 10" prints come in 12" x 16" mats. The 16" x 20" reproductions are not matted, but rolled when shipped for the safest possible shipping. 16" x 20" is a standard frame size so you can get a frame anywhere you choose. We're so excited about the beautiful frames we've chosen for our smaller prints. 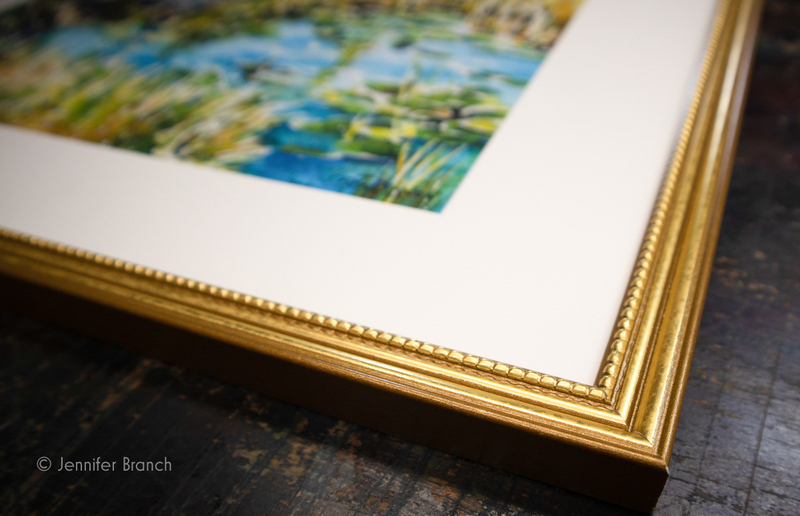 We have a lovely, delicate gold frame with subtle beading around the edge. And for a simpler feel, a plain black frame with squared edges. Both frame styles are wood and made in the USA. When you receive a framed reproduction, it's ready for you to hang on the wall! We don't offer original watercolor or 16" x 20" print frames at this time. Most prints are shipped in the next day or two by 2 day Priority Mail, USPS. The USPS shipping calculator is included on our shopping cart. If you need a painting immediately for a special occasion, please email us at order@branchstudio.com . We'll do whatever we can to get your artwork to you when you need it. All Paintings and orders over $50 shipped in the continental USA are FREE! International orders (if priced differently than USPS calculator) or rush orders will be priced and handled separately. All International Shipping is what USPS or our carrier of choice costs us. There is a shipping calculator on the Shopping Cart. There will be shipping charges outside the continental United States so please check them on your cart. We will never ship a painting before confirmation of any additional shipping charges (if additional services requested by you). For purchases within Georgia, there is a 7% sales tax charge. Gift wrapping that looks like a party! 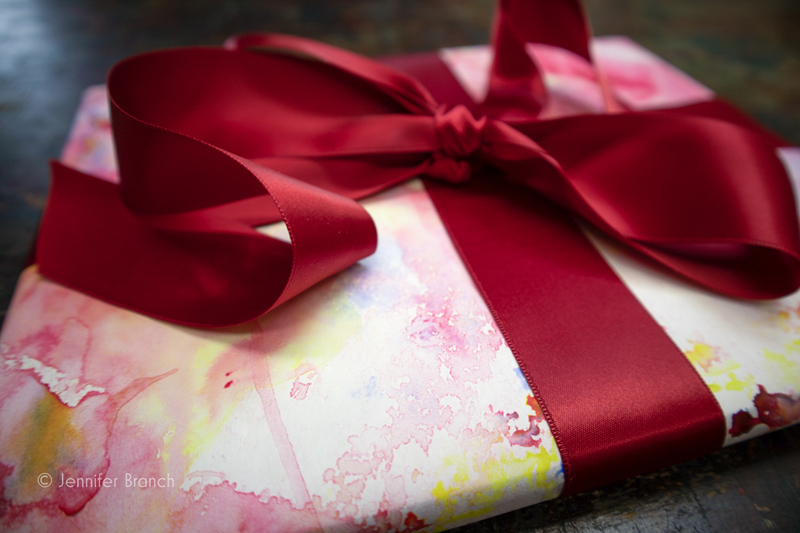 Our gift wrapping is hand painted in bright cheerful colors. We make our own wrapping paper because no other wrapping paper looked like enough fun! Gift wrapping also comes with a printed notecard, with the message of your choice. 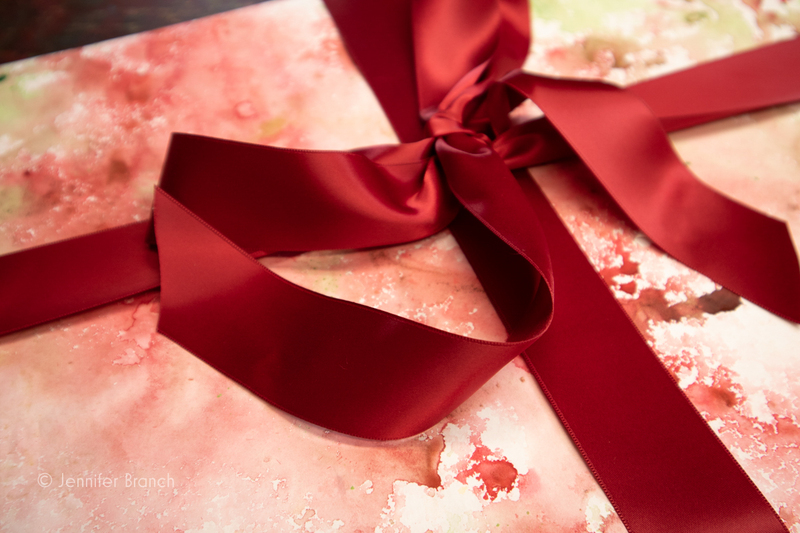 Since our wrapping paper is hand painted, every gift wrapped package is different. Colors and patterns will vary but have the same theme. Christmas wrapping is available seasonally. Gift certificates can be purchased when you know someone will like a painting, fine art print or workshop by Jennifer Branch, but you don't know which one! 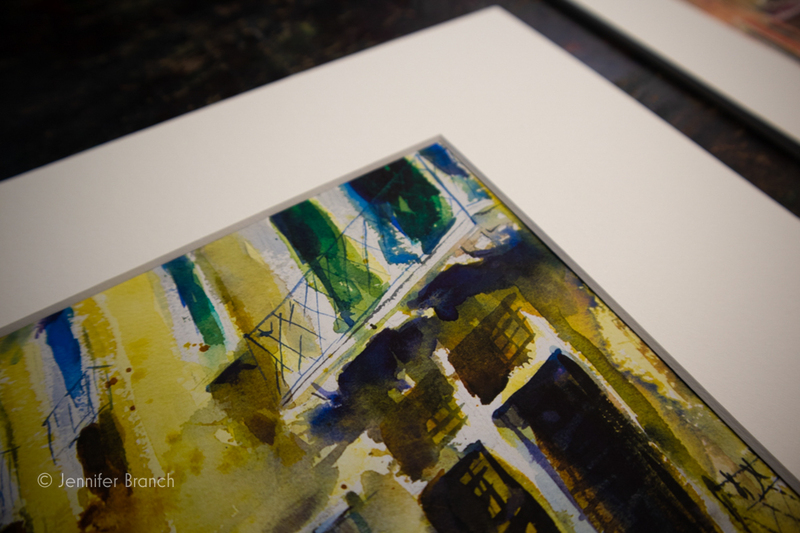 Gift certificates are elegantly printed on Jennifer Branch's watercolor paper notecards. We would be happy to write whatever message you want on the card. A discount code and the amount of the gift certificate will also be on the card and can be used through the web site or by phone. The full cost, including tax and shipping costs, is due before the painting is mailed. Payment is accepted through PayPal. If you have any problem with the painting or print when you receive it, returns are easy. Just contact Jennifer Branch Gallery within two days after you receive it and have the painting in insured return mail within 14 days. Only return paintings after you have contacted Jennifer Branch Gallery and always insure the painting. The full cost will be returned to you upon receipt in good condition. If the painting or frame is in a different state from that which you received it in (i.e. : marks, folds, misc. damages), the painting cannot be returned. In other words, you break it, you buy it. If you receive a painting in a damaged state, please inform the shipping company. If it's USPS, they will have you fill out a claim form. Contact us and we will work to correct the problem immediately. Sales made at galleries or art shows, since the purchaser has seen and approved of the painting before purchase, do not have this same refund policy. If you do have a problem with your reproduction or painting, please contact us immediately and we'll work out a solution. Jennifer Branch Gallery is not responsible for the painting after delivery in good condition. We use a secure website with a secure certificate by Lets Encrypt. All financial transactions are conducted by PayPal, for your security. Since this is as secure as we can possibly make Jennifer Branch Gallery's web site with an encryption equal to most online retail companies and the process is handled by very reputable companies, we accept no responsibility for anything going wrong. Jennifer Branch Gallery will never sell or distribute customer information. Tracking cookies are used on JenniferBranch.com, PaintingWatercolor.com and BranchStudio.com. Ironically, there is now a tracking cookie to comply with tracking cookie regulations. Sorry! We use a cookie to temporarily store a shopping cart and maintain login state so you can purchase items. Jennifer Branch Gallery does not and will never sell or use your information in any way not clearly listed on this page. Jennifer Branch Gallery's Newsletter gives updates on new paintings and upcoming events. There are several interest categories you can check and we'll send you information on only what you're interested in. You can remove your name and email from the mailing list at any time by clicking unsubscribe on an email. Soon we will have a way to update your preferences. All information you give is for Jennifer Branch Gallery's use only. We value our privacy and yours. Disclaimer: Jennifer Branch Gallery is a participant in the Amazon Services LLC Associates Program, an affiliate advertising program designed to provide a means for sites to earn advertising fees by advertising and linking to amazon.com. Most items can be bought multiple places. Any other recommendation links I receive no compensation for. All items I recommend are the best tools I can find for the purpose. That is the ONLY reason I recommend them. I place Google AdSense ads on PaintingWatercolor.com, BranchStudio.com and my YouTube channel to help support the websites. I do not have control on what ads show other than to block categories or a specific ad. Please tell me if something shows up that's offensive and I'll block it if I can. I've chosen Google AdSense because it's simple to run and means I'm not affiliated with a specific company. If I recommend something, I'm honestly recommending it. I run an affiliate links with compensation on Amazon, but since I choose what products are in my Amazons ads, I only show things I actually use. I don't have to link to something I don't believe in. All prices are in $United States Dollars.